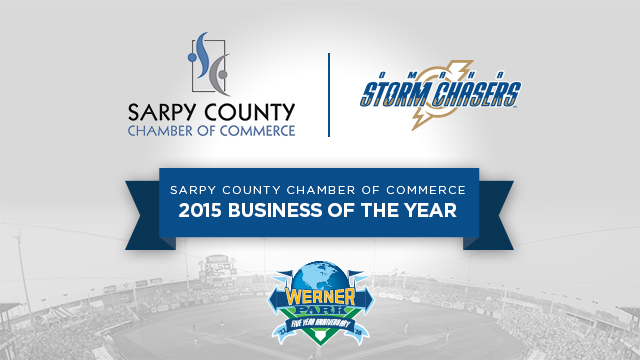 The Omaha Storm Chasers are the 2015 Sarpy County Chamber of Commerce Business of the Year in the 1-24 employees category. The Chamber awarded the Storm Chasers Organization at the annual Awards Dinner last Tuesday night at the Embassy Suites in La Vista. Assistant General Manager of Operations Andrea Stava accepted the award on behalf of the organization, which accepted an award from the Sarpy County Chamber of Commerce for the second consecutive year. Storm Chasers President and General Manager Martie Cordaro was the recipient of the Business Leader of the Year Award in 2014. "It is with great pride that the Storm Chasers Organization accepts this award," said Cordaro. "It was an incredible season at Werner Park as we celebrated Back-to-Back Triple-A National Championships and had the privilege to host the First National Bank 2015 Triple-A All-Star Game. As we prepare to celebrate our Fifth Anniversary at Werner Park in 2016, we pause to thank the Chamber for this gracious honor and congratulate the other nominees." The 1-24 Employee Business of the Year nominees included Bellevue Travel, Crosse Point Innovations, Lucky Bucket Brewing Company, Microtel Inn & Suites, National American University, Omaha Blue Waves, Peak Pathways, Soaring Wings Vineyard, and the Filter Shop. Storm Chasers Premier Partner Pinnacle Bank was named Business of the Year in the 25+ Employees category. Tim Burke, CEO of OPPD and presenting partner for the 2015 Triple-A Home Run Derby was named Business Leader of the Year. Other winners are also current Storm Chasers partners, and included Heartland Family Service for Non-Profit of the Year and Primrose School of La Vista for New or Emerging Business of the Year.